DMS Fine Arts Academy presents "A Hip Hop Christmas"
On Friday, December 7 at 7 pm come out and enjoy a concert you definitely will not forget. 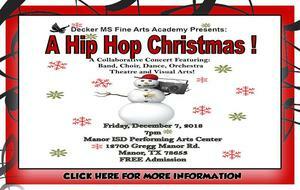 The Decker Middle School Fine Arts Academy presents "A Hip Hop Christmas". This concert will be a collaborative showcase featuring Decker's Band, Choir, Dance, Orchestra, Theatre and the Visual Arts department. Come to Manor ISD's Performing Arts Center and do not miss out. Free Admission, again I repeat FREE ADMISSION! For more information contact Mohneesha Washington at mohneesha.washington@manorisd.net.